The colony of Ellis is the pride of the united States. America's newest state has grown into the largest and most important colony in the American Arm. Hard work, ingenuity and persistence turned a desert planet into a breadbasket. While the future seems nothing but bright for Ellis, the colony has serious problems. Crime is on the rise as the planet's population grows. Smuggling is as endemic on Ellis as any word in the American Arm. The supremiacist New America movement, thought dead since the post-Twilight Era recovery, has found fertile soil in which to spread its message of isolationism and intolerance. 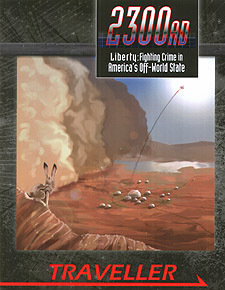 Liberty: Fighting Crime in America's Off-World State is a sourcebook and two adventures for 2300AD. It outlines the culture and politics of Ellis's state capital, Liberty, and several of its prominent citizens. The first adventure, Profit Without Honour, places the player characters in the roles of federal agents investigating a major drug trafficking ring. In the second adventure, Desert and Reward, the player characters hunt for a hidden compound full of New America fanatics. The Traveller Core Rulebook is required to play 2300~AD.